This annotation simply indicates that the affected bean property must be populated at configuration time: either through an explicit property value in a bean definition or through autowiring. The container will throw an exception if the affected bean property has not been populated; this allows for eager and explicit failure, avoiding NullPointerExceptions or the like later on. Suppose you have very large application and you get NullPointerExceptions because required dependency has not been injected then it is very hard to find out what goes wrong.So this annotation helps us in debugging the code. This is simple pojo class having some attributes so here country has name and object of Capital class. 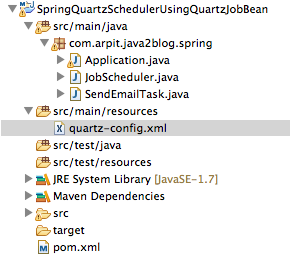 Create Country.java under package org.arpit.javapostsforlearning.Copy following content into Country.java. This is also simple pojo class having one attribute called “capitalName”. Now you can note here that we have not injected capital property into country class but we have used it for getting capitalName in below RequiredAnnotationInSpringMain class. When you will run above application,you will get following as output. That’s all about Required annotation in Spring.